Television Sound Engineering, authored by Dennis Baxter, has been published in both English and Chinese and is recognized by sound engineers around the world as the primer for the serious audio student. Baxter is currently writing a second book that will be the first definitive book on broadcast surround sound. 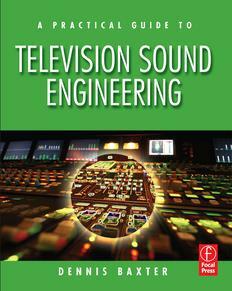 Download a sample chapter of "A Practical Guide to Television Sound Engineering." Dennis Baxter is well-known as an expert in innovative broadcast audio. He has been featured speaker at major industry events around the world, authored numerous articles, columns and papers. "The Sound of Sports", a BBC award-winning radio documentary produced by Peregrine Andrews featuring Dennis Baxter and other leading audio engineers. Dennis Baxter is a featured columnist for “Broadcast Aside” in Resolution Magazine and "Inside Audio" in TV Technology. He has authored many feature articles for both publications as well as ProAudio Asia and Professional Sound Canada. © 2019 Dennis Baxter Sound, LLC.